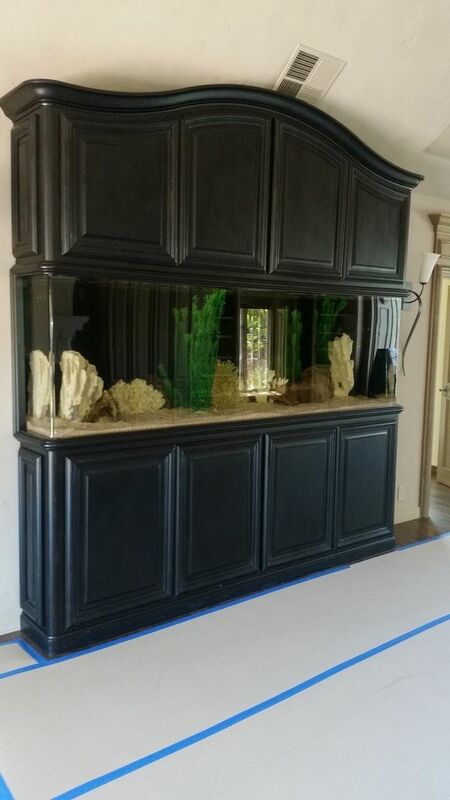 How to move a 700 lb fish tank with one guy? 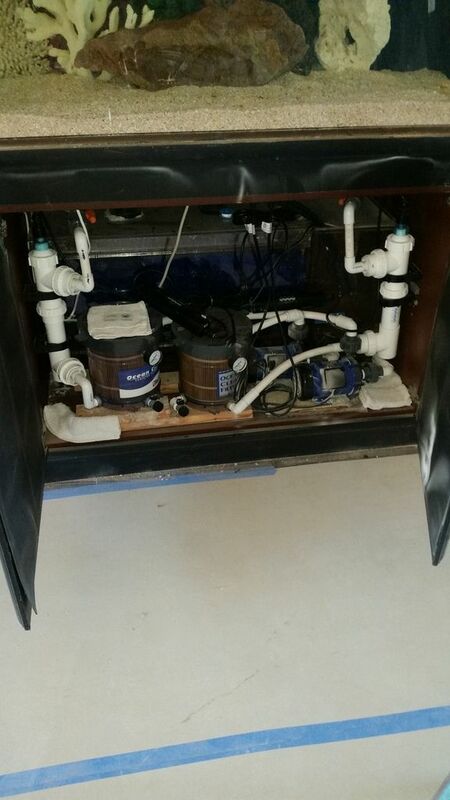 Step two, empty water and dismantle light, Plumbing. So what now? Build a rolling dolly that is the same height as the stand that will be the new stand! No lifting requited! Well that all sounds well and good until I tried it.. Strap dolly to old stand. moved the tank on to the dolly and it was sketchy.... way to sketchy to even be around... tried to roll it and o e of the casters folded and bent it's axle... the casters are rated at 300 lbs each... so with some quick thinking I screwed some braces on and strapped it back to the old stand. Back to the store and bought 4 more casters, these ones rated at 600 lbs each... 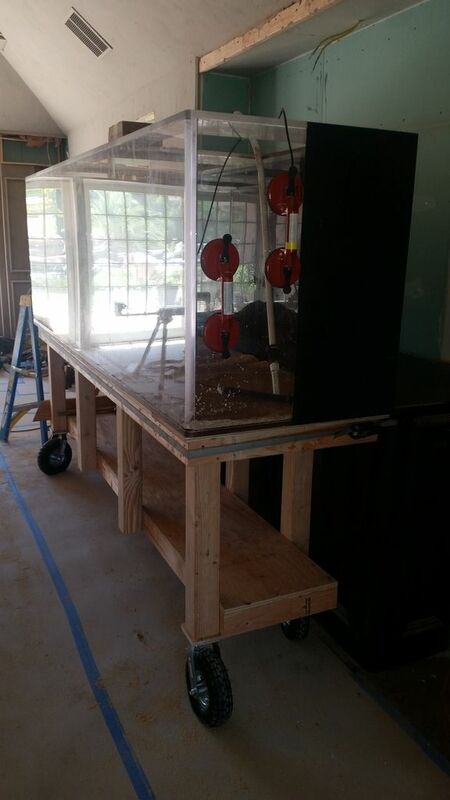 I used cribbing and a 10' 2x4 to lever the tank and stand back up so I could get the tank back on the orignal stand. Added some bracing and widened the track with by 5" on both sides, now I'm just 2" inside a standard door opening..
Slide tank back on dolly/new stand and roll nice and easy out of harms way.. Step five will be getting the tank out of the house and on the trailer then drive 400 miles and get the tank over the lawn, up on the deck and in my house... I do t see how hard that could be??? When I get the tank to its new home I will lift the entire deal up and remove the feet and casters, then skin the stand, add doors and strap it to the wall. This one is 500 gallon salt. If yer dad was sposed to yell at you, he should have when you told him bout the tank lol. I had the most fun with a 55 gallon I had some Wimple Piranha in. I had four nice one, about 6"-8" long. My ex poured bleach in the tank and killed them the day she left. I've not had another tank since. Now I remember,why I stayed fresh water tanks. Good Luck..
Im into the Saltwater tanks myself. I just have a small one right now, and some days its a handful. 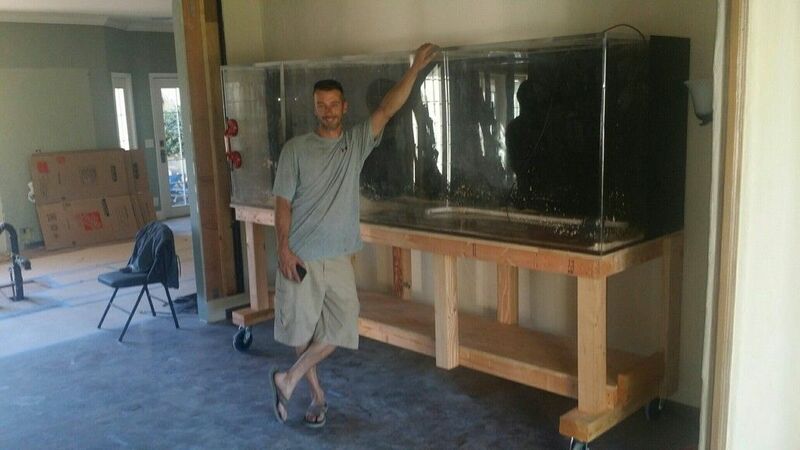 I would love to have a larger one, but the largest I want is a 150 gallon. Although, if I had the opportunity and the price is right I would consider something larger. Want a 200 lbs TV ? With help, and a hand truck, it was moved outdoors early January. I have yet to get it hauled away. My advise, give it away again before you're too old/weak to move it again. I'm sure you already know thss, but I'll add it any way. Wherever that thing goes, make sure the floor can handle it. What does it cost to maintain a 150? I honestly can not say as I dont have one yet. Im using Red Sea tanks, right now I only have my 34 gallon up at the moment and as soon as this tank is established I will be moving it into a 65 gallon. Eventually moving up in tank size to a 150. Im not sure if your into the hobby, but the initial startup is not cheap. This hobby is just as expensive as owning cars. You can get basic equipment from the start or you can buy top of the line. Just my 34 gallon I have well over 1k in equipment. I found the tank on Craigslist for dirt cheap so that is a plus and that doesnt include the live rock, live sand, corals or fish. Let's see, 700lb to start and THEN add water? Total weight will be @ 5,000 Lbs, with rock and water maybe a little more. I'm in the process of taking down my 75g salt tank. I had all kind of coral, and the fish were great. Even though I hardly ever did water changes my system worked well, but keeping the glass clean was just too much of a chore for my taste. Hmmmm....I dunno? I don't really think that tank is big enough to house a 700 lb. fish! Should I get a bigger tank? I guess my plan of yellow fin tuna is out?